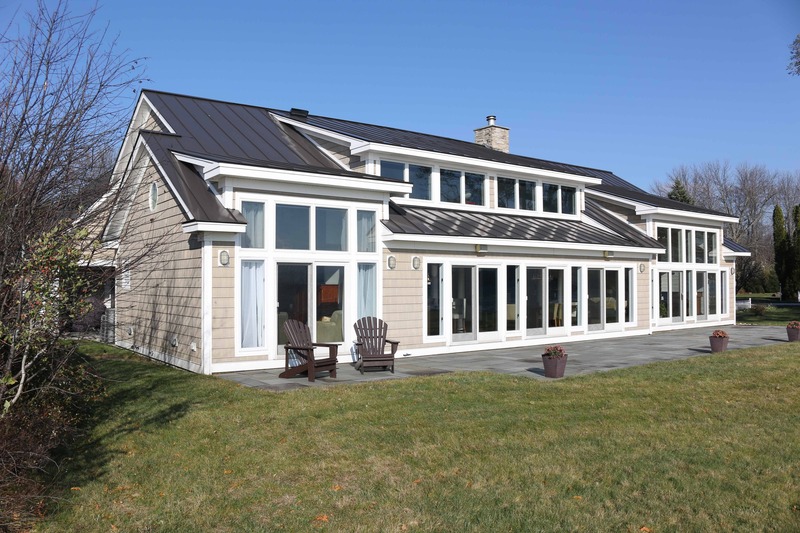 Leading architectural firm TruexCullins designed this award-winning home specifically for the site. This 31.5 acre Lake Champlain estate contains a secluded crescent beach with grandfathered boat launch. Its park-like grounds possess majestic white pines and old growth oaks with spectacular views of the Adirondacks. The home's meticulous design and craftsmanship blend natural materials, functionality and elegance. An impressive stone and glass atrium walkway connects the wings of the house. The custom kitchen opens to a dining enclave overlooking the lake. The kitchen also serves a large circular slate and stone veranda as well as a stunning great room with a double-sided stone fireplace. The private bedroom wing has a relaxing, lakeside master suite with a sunroom. An easy 20 minutes to Burlington Vt. Additional renovated Farmhouse & lakefront lot. Exceptional quality is found throughout this very special lakefront home. Located in Lost Cove, offering 230 feet of protected shoreline, mooring and dock. Very convenient to I-89. Montreal is within 50 miles. Elegant New England shingle style home with barn/guesthouse on 17+ acres with east and west lake access on Shelburne Point. This beautiful sunny house built by Roundtree Construction is sited perfectly on a completely private and landscaped lot w/ 40x20 Gunite pool. The gorgeous kitchen w/ marble counters, stainless Meile, Thermador and Viking appliances, overlooks large yard w/ patio & pergola. First flr has beautiful dimensions and spaces, large windows & many ways to walk out to patios and porches. Dine al fresco on lovely screened porch. Sunny master suite has spacious bath w/ soaking tub & oversized shower. Second floor has three bedrooms & office. Terrific 3rd floor is great artist or guest space w/ 3/4 bath. Finished basement with sauna, workout room, rec room and living area. Barn has large shop space and guest/living area with loft, darkroom and 3/4 bath. Mooring rights in protected cove and 2 beautiful beaches to relax on. This is a rare opportunity for a beautiful property! Did you say you are looking for the best views and clear deep water on Lake Champlain? The western views from this custom home are outstanding with ultra privacy and an easy walking path & stairs to the water with lakeside deck. The water is deep and clear for wonderful swimming and boating. Only 15 minutes to Burlington downtown restaurants, UVM and Burl International airport......this home is a rare find on 16.63 acres & 600 ft of lakefront. You can feel the quality of construction when you step inside with cherry flooring, top of the line windows, custom ceilings and moldings. An open floor plan with intimate spaces including an Adirondack styled family room, first floor master suite, well designed kitchen & more. The owners take incredible care of this property and it shows. Appraised over $1.6M this is the best price on the lake for quality, views & private acreage close to Burlington. Easy to build a guest house or more with this type of acreage. A secret location on the lake! Fish Bladder Island is an incredible oasis in Lake Champlain located just minutes off the S Hero causeway in the Champlain Islands. The island is comprised of 11 acres of meticulously manicured landscaping and ever present lake & mountain views. A pristine wide shale southwest beach and beautiful beaches on the north and east side give this island unique wonderful character. High cliff lookouts to the south side with many rock ledges. The Island features protected coves for dockage & 350 mature trees. There are two residences,a new carriage house(850sq') & antique cottage(850sq') to accommodate family and friends. A $60,000 propane 15kw generator/battery system provides 240 amps of electrical service to run all systems smoothly & effectively. 2nd generator is installed & 4 bedroom septic design approved to build another house. New purified lake water intake system & 2500 gal propane tanks make this island a modern getaway! Mainland dock,20 min to Burlington & a quick trip to Montreal! Near a covered bridge over Lewis Creek is this magical 24 acre private mini compound. Rolling topography with layered southwest mountain views, a brook running through woodlands, open meadows, pastures,& a perfectly positioned pond in view of the house are all captured on this sunny Big Sky property! The house is a mix of an English Cottage & Vermont Farmhouse. A "Not So Big House" for energy efficiency and built with non toxic materials this property has a mix of the right rooms. The great room kitchen with Wolff 6 burner range,Sub Zero Frig,Italian tile and radiant floor heat moves to the south facing living room and porch. Hand crafted floating Brazilian cherry staircase to second level with cherry flooring. Master suite is south facing with Waterworks sink and Venetian glass tile shower. Third level 4th bedroom, bath and living area. Woodshop is a perfect future studio/yoga space. Sweet small barn for animals. The artists/owners have poured their love into this Vermont home. Beautiful private Lake Champlain home facing west to sunsets over the Adirondack & only 20 minutes to Burlington Vt! As if on the bow of a ship, the views are expansive across Turtle Bay (Outer Malletts' Bay) & includes a level, easy access shale beach with 350 feet of lake frontage. This waterfront property is ideal for boats with two moorings, a dock and boat lift. The clear water is ideal for swimming, entertaining & fun! Be sure to watch the video for a view of our lake living! Minutes to the broad lake, Valcour Island, Willsborough Bay, NY & Burlington Vt for superb sailing & boating. This loved home has a private setting and a floor plan that takes advantage of the views from every room. The first floor is complete with a Master Suite, great room with wood ceiling & stone fireplace, chefs Kitchen, Viking stove, dining room, screened porch, deck with beach access, hot tub, office/bedroom, mudroom & three car garage. The second level Master Suite with spa bathroom has commanding views west! The second level features an "en suite" bedroom & private bath, a fabulous great room with custom built-ins/wet bar. The 4.58 private acreage is complimented with mature cedar trees, easy care lawn, patio, gardens, paved driveway & whole house generator.The shake and stone exterior is a classic detail for a custom Lake Champlain property. Come visit this home and be inspired! South Hero is a wonderful community with easy drive to Burlington for restaurants, shopping & airport! This gracious, updated condominium on Shelburne Point has it all. 4.6 acres of common land with 575 feet of shared waterfront on Shelburne Bay with expansive views of the Green Mountains. The condominium comes with a slip on a shared dock with power, its own mooring, stairs to protected beach, and storage for canoes and kayak. Completely gutted and renovated in 2012, this striking waterfront condo enjoys 3 levels of living in the historic Eastlake condos, originally built in 1892 and converted to condos in 1984. 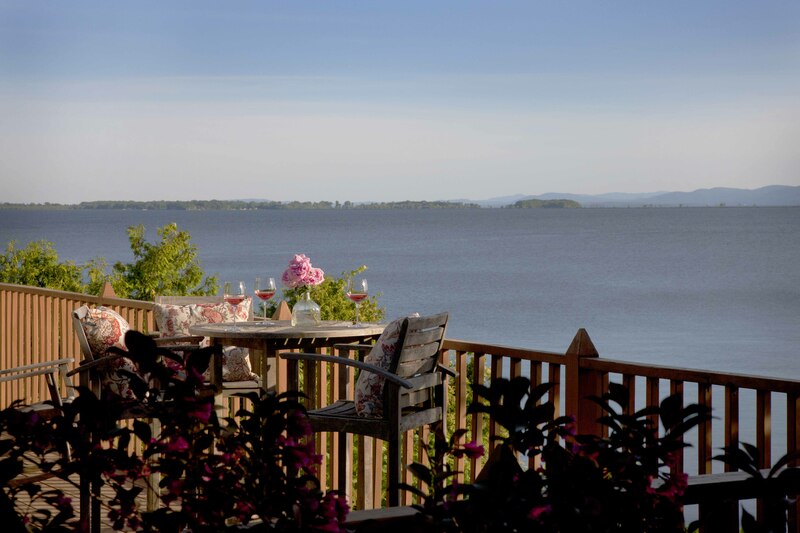 Tucked in Shelburne Bay with incredible east-facing views of Lake Champlain and the Green Mountains. You would be pleasantly surprised at how close this house is to Burlington-an easy 20 min-closer than Charlotte Lakefront! Big lake views from very room and a wide private shale beach with clean swimming water. Add an exciting interior and this home is an A++! Vaulted wood ceiling in great room with stone fireplace & Artisan gas insert. Kitchen w/Viking stove,Commercial grade exhaust hood,granite counters,New porcelain tile flooring,New tile backsplash and big lakeviews. Venture outside to a full deck,screened porch on the lakeside with hot tub,side patio sitting area & stairs to beach. First floor private master suite /guest area on south side offers terrific light and beautiful new tiled shower & sunken tub. The upstairs master bedroom suite has commanding views,stone fireplace with gas insert, large sunny deck and tiled double shower & jetted tub facing the views. You need to "feel" this property today!